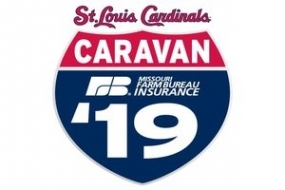 Hey fans, the 2019 Cardinals Caravan is coming to Decatur! Presented by Skeff Distributing! Join us for the chance to talk baseball and meet current players, alumni and broadcasters. There will be autographs for kids, Cardinals prize drawings and more. The noon event will be emceed by team broadcaster Dan McLaughlin. Also scheduled to appear are St. Louis prospects Justin Williams and Ryan Helsley and former Cardinals Ryan Franklin and Kerry Robinson. DeJong totaled 19 home runs and 68 RBIs last year, one season after hitting 25 homers and placing second in Rookie of the Year voting. St. Louis acquired Robinson from Texas last month in exchange for Patrick Wisdom. Tickets are $3 and are available at Neuhoff Studios – 250 N. Water St. Suite 100 in Downtown Decatur.